Property Details: 3 Bedroom, 3 Bathroom Property with approx. 1988 square feet. Gulf Shores condo for sale at Bel Sole . Gorgeous 17th floor west corner unit. Fabulous views of Lagoon and Gulf. Tile floors throughout living areas, carpet in bedrooms. Kitchen features granite counters, stainless appliances, and a wet bar with ice maker. Master bathroom has a large jetted tub and separate shower with double vanities. HVAC replaced January 2018. This unit comes with a storage cage on the 1st floor. 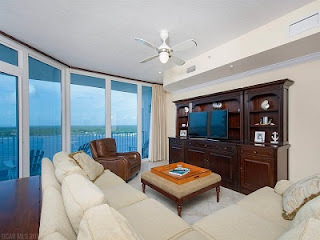 Bel Sole offers indoor and outdoor pools, fitness center, deeded beach access, and a first come first serve boat slip.